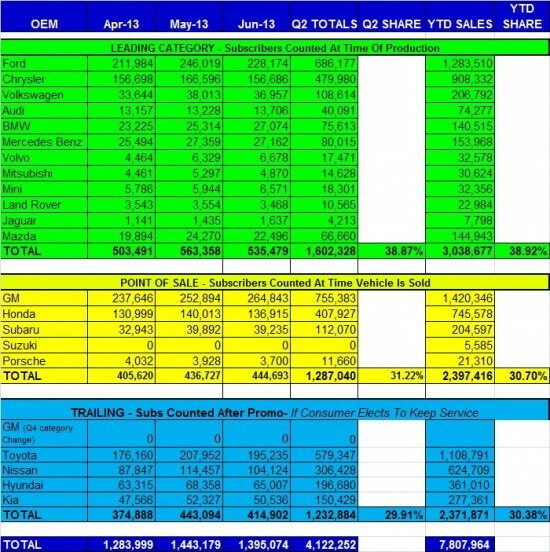 June auto sales are in and SiriusXM is virtually certain to benefit from the numbers. For the first time in 5 years we have a SAAR of 15.9 million, and sales for June were up almost 9% over last year. Many automakers set June sales records, and all together we saw June deliver a sales number of 1,395,074. Better still, through the first 6 months of 2013 we are up about 7.5% over the first half of 2012. Q2 auto sales were at an impressive 4,122,252 units. With satellite radio installations trending at 66%, the quarter saw about 2.7 million SiriusXM radio's roll off of dealership lots. I have long said that auto sales of 1.1 million per month this year would equate to the company reporting a decent quarter. The average in Q2 was ahead of the 1.1 million pace. SiriusXM will be reporting its Q2 numbers in the coming weeks, and investors should be able to go into the quarter with confidence. What do u think the sub for the quarter will be??? ?